Choose Your Shipper Wisely . . .
Hams ask me why I recommend FedEx as a shipper for their precious radios. 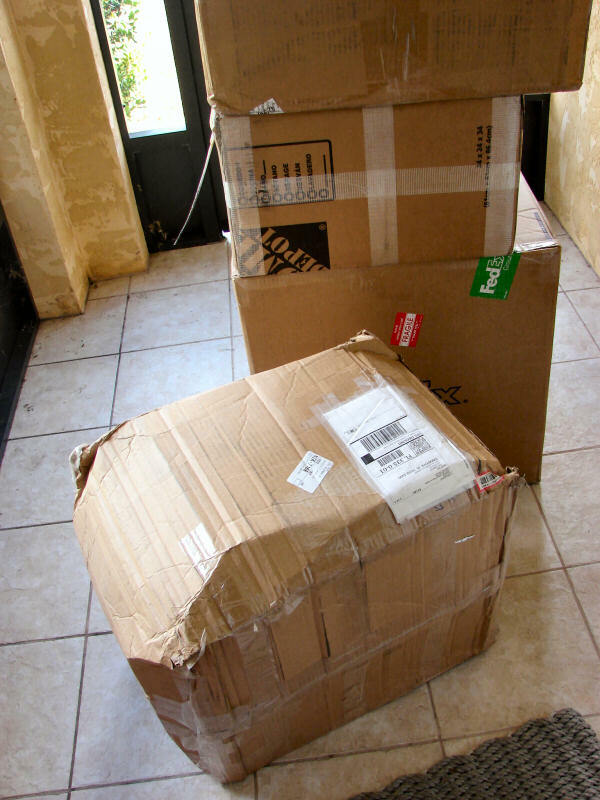 Having received hundreds of radios via FedEx and UPS, it has become apparent that FedEx is the far gentler shipper, with almost no damage inflicted to rigs over the last several years. That is not the case with UPS. EVERYTHING from them comes in with the cartons severely beaten, and only those items that are exceptionally well packed survive with no damage. 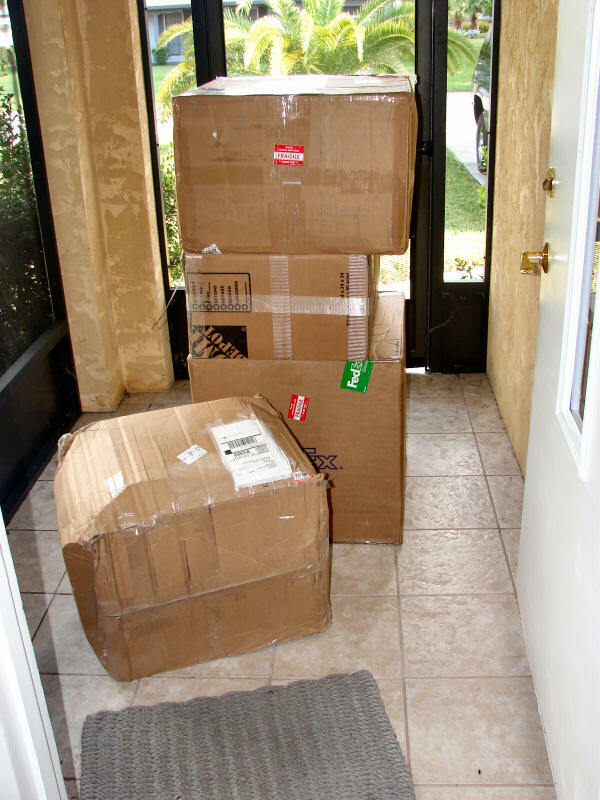 If you ship UPS, triple box, use LOTS of packing, and insure it well. Today (September 19, 2008) I received four radios. Three were shipped via Fedex, one via UPS. This is what I saw when I opened my front door. You'll notice the three neatly stacked in the rear were delivered by FedEx. The one in the foreground came from UPS. The box has been smashed on all corners, all edges, it is beaten to the consistency of a marshmallow! There are tears in the carton, it is absolutely not re-usable. The radio was double boxed with lots of packing. Even so, it has received massive jolts from every direction. I had to unpack and inspect, because of the likelyhood of damage. It looks to have survived, but the VFO dial is jammed down solid from impact(s). I really won't know more until I get it on the bench. UPS is earning their nick-name, "United Package Smashers" . . .
All Photos and content copyright 2005, 2006 K4EAA, Ken Kemski.